If you follow my blog regularly, a couple of weeks.. really?? 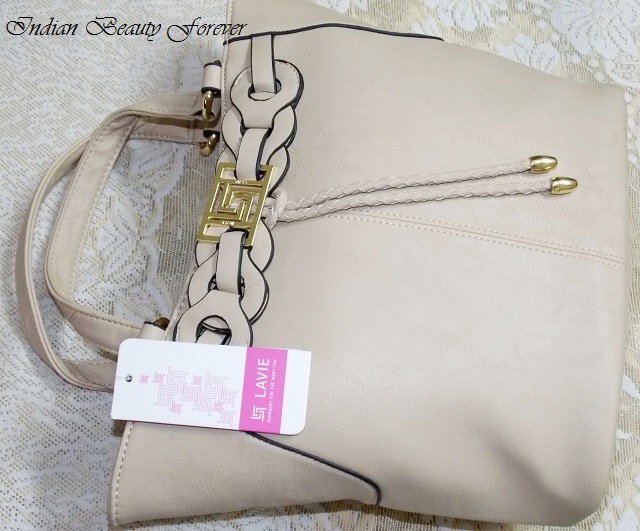 May be a month or 2 ago, I attended Lavie event where they showcased their new handbags and shoes collection. Awesome collection that was! If you want to see that new collection photos have a look here. 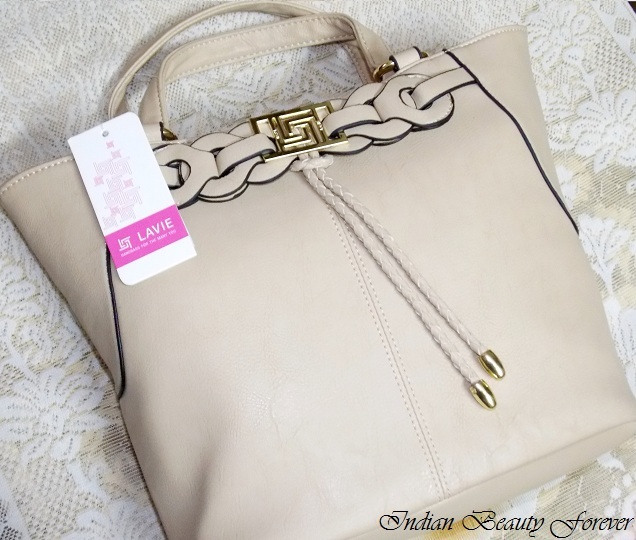 After the event, I was given a voucher with which I chose this beige beauty, I have lot of sling bags and absolutely love them but this time, I chose this pretty beige one short straps. 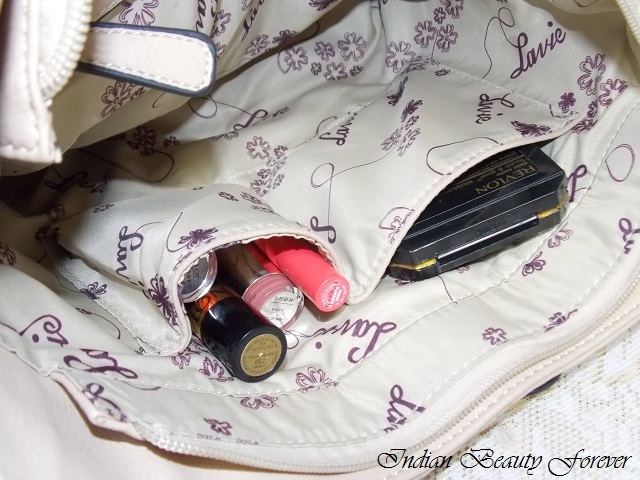 My views- Honestly, while I was picking this bag, I was under the impression that it will be a small and my go to bag that can be my companion when I don't feel like carrying slings or the big hobos. In fact, this bag has lot of space and once you keep your stuff inside, then you can realize that even if it doesn't appear to be a huge bag but still, it can carry a lot of your stuff. What I like the most about this bag is that you needn't to literally dig inside to search for something. Everything stays in place because of the design that's broader at the top and a narrow base. Isn't that great? All I have to do is to just hang it on my arm or carry it like a regular bag and I am good to go. Before I go about describing the interior of this bag, let me begin with the exterior first. this bag is not a pure leather bag, it is made up of synthetic material, may be PU but there is different varieties of PU also, from cheap to good quality ones, and this has definitely got that quality! 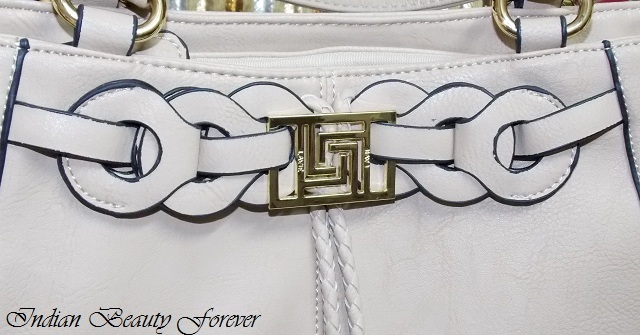 On the front side, it has got a pretty braid sought of intertwined design that also seems to carry a shiny gold buckle which bears the brand name "Lavie". From the center of that design hangs two strings with metal ends that adds some spark to the otherwise plain and simple design! 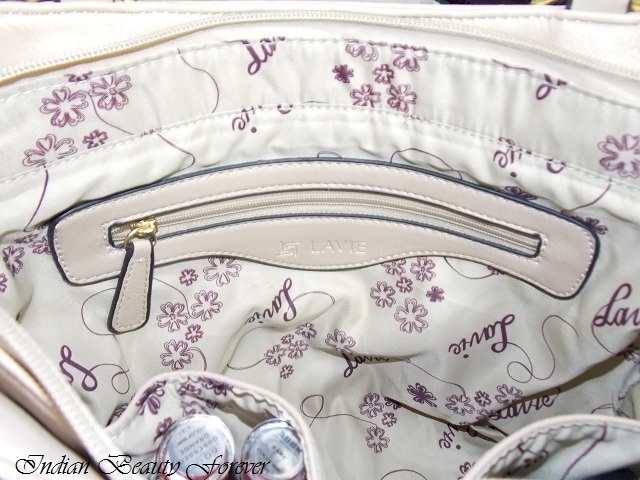 Anyways, Inside, there is a zipper pocket and two non zipper ones. 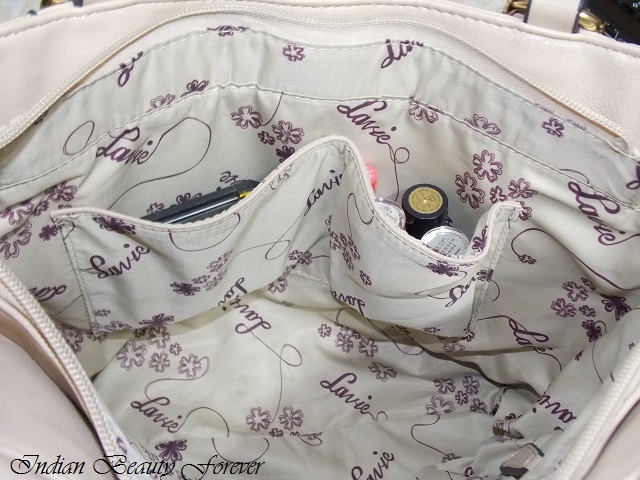 The bag has been lined with a soft cloth that bears Lavie all over it. This feature would be in all of their bags, supposedly!! Alright, so as I have dissected the bag inside out for you.. Dissected!! what??? Noh.. I want to use it. Still under the hallucination of those zoology classes, I guess. As the bag is Beige, it makes a good choice for everyday office use and also, black, white and beige are classy colors that can go with all the dresses and not to forget age groups as well. 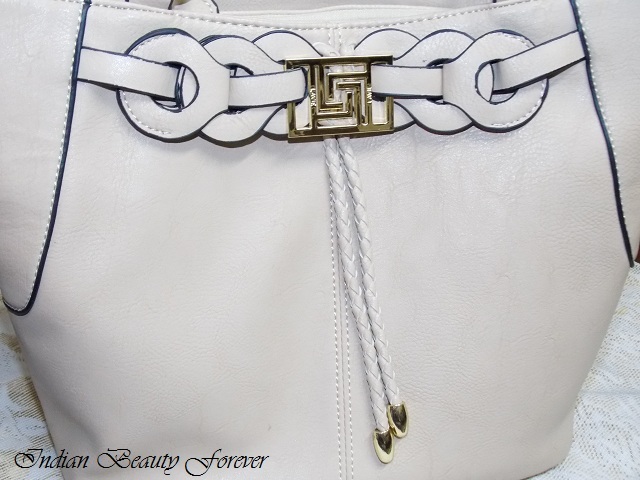 Style and design of this bag can be appealing for most of us. I should says, it's simple and classy. The material and finishing is clean and neat as in well finished!! 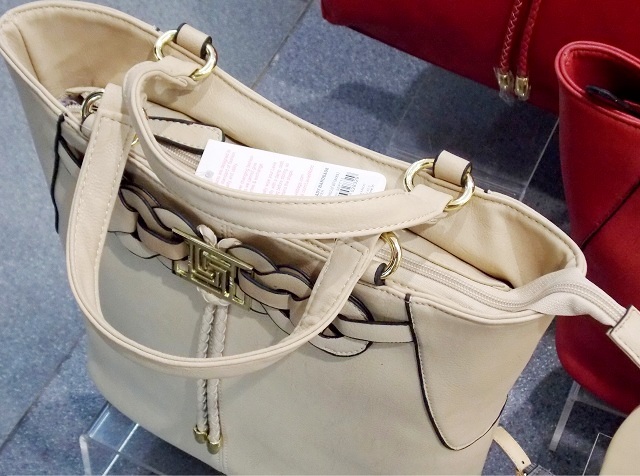 You can wipe such non leather bags with a wet sponge or cloth, if you happen to see any stains on them. So, overall, I like this bag. the same style/design is also available in cherry red, if you are more into colored ones. And also, this entire new collection of handbags and shoes is available here on Jabong.com. While I was just checking the site, I realized that they have got this huge variety more than 240 Lavie handbags that includes all of them, I suppose, right from satchels to slings, to laptop bags to totes and what not!! same goes for shoes. ***PR sample chosen by me for the review, though review is honest and complies with our policies!! !